Our wooden airplane rocker is a classic design, representative of how toys used to be made. This timeless children’s toy is sure to become a treasured family heirloom that is passed on for generations! 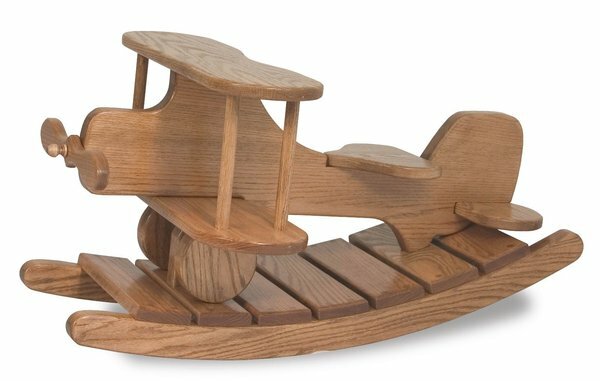 This airplane rocker is Amish handcrafted in the United States, something that cannot be said for many children's toys! This is the perfect gift for your child or grandchild. This Amish Wooden Airplane Rocker is handmade in America from solid Oak wood! Show them how you used to play. Forgo the batteries required for electronics and instead teach the youngster in your life to appreciate a more simple playtime experience. Encourage creativity as your child or grandchild plays make believe, soaring through the skies from the comfort of authentic Amish handcraftsmanship. We'd love to answer any questions that you may have about our Amish Wooden Airplane Rocker. Please get in touch with our team of Amish furniture experts by calling 866-272-6773. If you're in the Sarasota, Florida area, stop by our Amish Furniture Store to take a look at a snapshot of the built-to-last products we offer online. I just wanted to drop you a line to let you know the baby shower was last weekend and the photo of the rocker you folks are making was a BIG hit. The mom is so excited! Her husband told my husband yesterday she is still excited for it a week later, and keeps going on and on about how it is being especially made for their son. Thank you so much for being so prompt with getting such a nice professional quality photo in the mail. We are all really looking forward to the delivery. Again, just wanted to pass the happiness along. We received the rocker this week. I want to thank you from my heart. When I opened the box and saw "Boomer" on the plane I cried. As I am writing this now I cry. Things have been unbearable at times. It is nice to know there are still compassionate caring people still out there. I've shed many tears due to the inconsideration of others. The loss of my husband and the father of my 4 sons has literally broke me. People that don't know that pain don't understand. But you do. You took the time to listen and went the extra mile or more to make this right for us. You did not treat me like a number. You made this personal and followed it through. Thank you so much! I hope you know truly how much your kindness has meant to me. I hope your employer knows what an asset you are to their company. Just wanted to thank you for all your help and the personal assistance…tell your boss I said you deserve a raise…I picked up the airplane rocker this morning. No problems, met the owner, saw the shop and love the rocker. Many thanks for helping to make our grandsons first birthday even more special.